Pedestrians – If Primus mated with the Beastie Boys….this is what might happen. Since the band was founded by the late Darol Matto and vocalist Mike Lewis in ’93, they have been turning out stand-out performances and drawing large crowds. 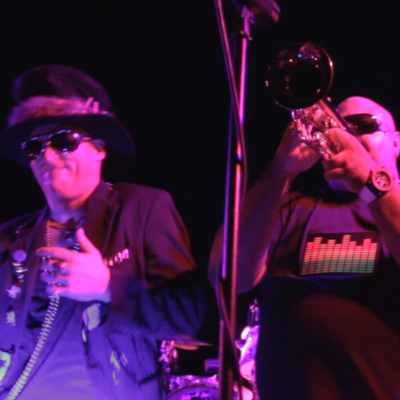 They enlist wild stage antics, obscure bass lines, a rhythm section whose heart beats as one, and a horn section that expands on the groove to create a dance party element. They infuse psychedelic guitar lines, with elements of rap, funk, and punk layered with dual vocals drawing from rap and rock with infectious lyrics and a dash of chaos. By choice they remain a desert treasure choosing not to tour. Still active they play several times a year and whenever they come together a full blown party breaks out. Percussionist/vocalist Rob Peterson, and frontman Mike Lewis began working together in Groovalopagus in the early 90’s. Bassist Armando Flores and drummer Tim McMullen started out in Lung Cookie and later B Movie Superstars making them a rhythm section to contend with, The over-the-top horn section is Cesar Hernandez on trumpet (Monsta X/ Totem Polka) and Morgan Fitch on trombone, and replacing guitarist Brandon Ray Henderson (Parosella / Family Butcher) is David Macias of Machin’.